High-resolution images with superb anatomical details enabled by faster processing and advanced auto-optimization algorithms. Featuring an all-glass keyboard that enables ‘sightless navigation’ via Tru-Sense technology, bkSpecto has an intuitive, rapid, touch-based workflow that can be configured and personalized for your practice. bkSpecto is designed for your workspace, allowing you to work faster. Adjust monitor (portrait or landscape), interface angle, and system height to suit your needs. An integrated battery also allows for more than 1-hour of plug-free imaging. 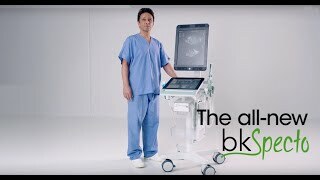 The new transducer architecture brings together BK’s patented biopsy routes with higher image quality, one hand connectors and increased sterilization options.